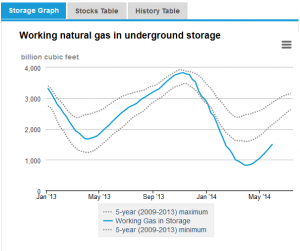 Storage:Working gas stocks continue to climb. Working gas in the Lower 48 states posted its fourth straight week of net injections. Net injections into storage totaled 56 Bcf during the storage report week, compared with the five-year (2011-15) average of 79 Bcf and last year’s net injection of 101 Bcf during the same week. As a result, the surplus in storage compared with the five-year average declined from the previous week to 813 Bcf, and the surplus compared with year-ago levels decreased to 816 Bcf. The 2016 refill season remains well behind the pace of recent injection seasons. Cumulative net injections into working gas total 201 Bcf thus far in the 2016 refill season, compared with the five-year average (2011-15) of 262 Bcf and last year’s tally of 393 Bcf during the same period. Despite the slow start to the refill season, working gas stocks remain near record-highs for this time of year. Working gas stocks as of last Friday were 58 Bcf above the previous five-year (2011-15) maximum of 2,623 Bcf for this time of year, which occurred in 2012. This surplus over the 2012 refill season record level increased for the third consecutive week. Cumulative net injections totaled 149 Bcf at this point in the 2012 refill season. January futures price continues to trade at more than $1 above current spot price. Decisions about whether to inject gas into storage during the refill season are often made with an eye toward the upcoming January, because it is typically the coldest winter month. During the most recent storage week, the average natural gas spot price at the Henry Hub was $1.94/MMBtu, while the Nymex futures price of natural gas for delivery in January 2017 averaged $3.11/MMBtu, a difference of $1.17/MMBtu. A year ago, the premium was 52¢/MMBtu, suggesting there is more financial incentive this year to buy and store natural gas in the summer for sale in the winter. The average Henry Hub price so far in the injection season this year, from April 1 to May 6, was $1.91/MMBtu, 27% lower than the average value of $2.60/MMBtu for the same period last year. This entry was posted in Uncategorized on May 13, 2016 by coreenergy.